World War Two veterans who transported vital supplies from Britain to Soviet ports are being recognised by the Russian Consul General in Scotland. The Arctic convoys carried food and military equipment across treacherous seas to support the eastern front over four years from 1941. Thousands of Scots sailed from Loch Ewe in Wester Ross and the River Clyde. They ended up at the ports of Arkhangelsk and Murmansk in the former USSR. Seventy-five years on, the Consul General of the Russian Federation for Scotland is holding a reception for 250 guests - including more than 40 veterans - at the Royal Yacht Britannia in Leith. Andrey A Pritsepov said: "Russia is indebted to the brave Scottish men who risked their lives in dangerous conditions to deliver vital aid and equipment to the eastern front. "It was a journey against all odds. Many have never returned. Their sacrifice and heroism comprise a proud chapter in our shared history. "With so many of the Scottish veterans now in their 80s and 90s, we felt the 75th anniversary was an important milestone to bring as many of them together as possible to capture their stories and ensure we have a lasting legacy for many more generations to come." 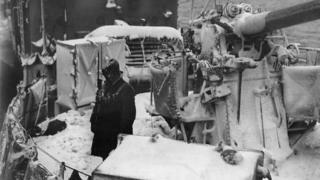 Conditions on the Arctic convoys were among the worst faced by any allied sailors and the loss rate for ships was higher than any other route.